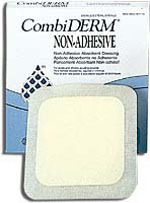 Convatec Combiderm 401848 - a top quality wound care product by Convatec! ADW Diabetes has a wide range of these and other wound care supplies at great prices. You are viewing Convatec Combiderm Sterile Dressing With An Absorbent Pad That Combines Super-Absorbent Technology With The Proven Benefits Of Hydrocolloids. Can Be Used As A Primary Or Secondary Dressing On Heavily Exudating Wounds. 8" X 8" - Sold By Box 5 by Convatec, a leading manufacturer of wound care supplies.